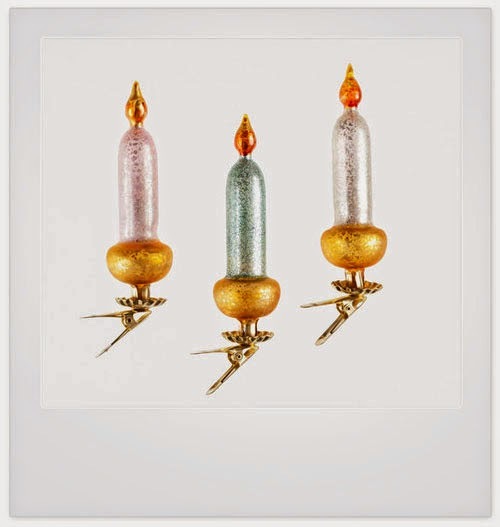 hand blown glass candle clip ornaments in 1950s hand colorings. hard-to-find, 1950s look, weathered glass ornaments with soft 1950s colors exactly like the german christmas tree ornaments you remember from days gone by. retro german 1950s candle light ornaments look wonderful on any tree. although they are no longer being made in germany; they are hand-crafted exactly like the original ones in the same special soft color tones that nicely compliment each other. purchase a single set of 3 or use them in multiples for a spectacular display. price is for 1 (one) ornament. must be purchased in multiples of 3 - receive 1 of each color (pink, green and white) as pictured.